An online master's in entertainment management prepares graduates to work as movie or television producers, music promoters, or advertising managers for production companies or studios. The degree provides valuable skills in media leadership, public relations, and management. Many entertainment management careers offer lucrative salaries, with the Bureau of Labor Statistics (BLS) reporting that advertising managers and public relations managers earn median salaries of over $110,000 a year. This article outlines what to look for when researching the top online master's in entertainment management programs. What Else Can I Expect From an Online Master's in Entertainment Management Program? 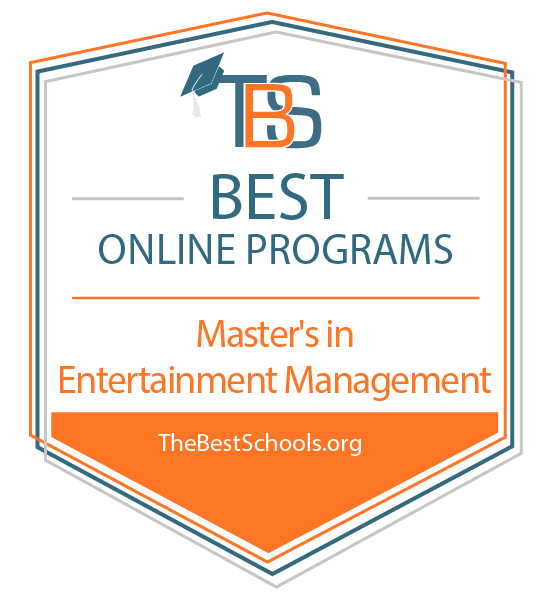 Online Master's in Entertainment Management Degree Program Ranking Guidelines: We selected the degree programs based on the quality of program and range of courses provided, as well as school awards, rankings, and reputation. Through its Frost School of Music, the University of Miami offers a Master of Music degree in music business and entertainment industries (MBEI) and a Master of Arts degree in arts presenting and live entertainment management (AP Live). Each program requires the completion of 30 credit hours, and many students graduate in as little as 18 months. The MBEI program offers courses and experiences related to music promotion, live entertainment legal issues, and publishing and licensing. The AP Live degree focuses on management, marketing, finance, risk management, and legal issues in the entertainment industry. To apply to either of the programs, prospective students must provide a resume, transcripts, a statement of purpose and three letters of recommendation. The programs may also request GRE scores upon reviewing an applicant’s academic record. The University of Miami is regionally accredited by the Commission on Colleges of the Southern Association of Colleges and Schools. The New School's master of science in media management program gives students a foundation in managing both conventional and emerging media platforms. Students work with a variety of media, including television, movies, social media, video games, music, and digital media. Graduates leave the program with a full understanding of media finance, distribution, marketing, production, and the development of new technologies. The 36-credit online master's in entertainment management includes an internship, in which students work directly with an established professional in New York City, as well as a capstone course, in which students create a thesis or business plan in their area(s) of interest. To apply, prospective students must submit a statement of purpose, a current resume, and two letters of recommendation. They may also submit a writing or creative sample of their work to supplement their application materials. The New School is regionally accredited by the Middle States Commission on Higher Education. Located in Philadelphia, Drexel University offers two master of entertainment industry management online programs: an MS in arts administration and an MS in television management. The arts administration program focuses on leadership in the art and museum world, with courses covering technology tools, management techniques, finance, marketing, and legal and ethical issues. Students may concentrate their studies on arts administration or museum administration. Students enrolled in the television management program engage in coursework focused largely on principles and best practices in management and programming. They also regularly participate in internships in major media markets like Philadelphia, Los Angeles, and New York City. While most of the program takes place online, students must attend an on-campus orientation and a two-day professional residency. Both programs require eligible applicants to have a bachelor's degree from a regionally accredited postsecondary institution, along with a minimum 3.0 GPA. Colorado State's master of communications and media management degree offers an in-depth study of traditional, modern, and emerging technologies, tools, and strategies that affect how individuals, groups, and organizations communicate on a daily basis. The hybrid program involves students taking six core courses in person at the school's Fort Collins campus. Students may then take their four electives online. The program requires 30 credit hours to graduate. As they work through the program, students take classes on human-centered design, using tools and platforms that help solve various storytelling problems. Students also explore the opportunities and challenges of digital communication channels, including the ethical dilemmas associated with them. To apply, prospective students must provide their GRE scores and hold a bachelor's degree from an accredited college or university. Colorado State is regionally accredited by the Higher Learning Commission. UC Denver's Anschutz Medical Campus offers a master of science in management with a specialization in sports and entertainment. The program focuses primarily on management, with courses covering finance, law and negotiation, global entertainment management, and corporate risk management. Students also must take part in an internship in the sports and entertainment industry. The 30-credit master of entertainment industry management online program also features "London Calling," a travel abroad course in global sports and entertainment management in which students learn about entertainment marketing at an international level. Eligible applicants must have a four-year degree from an accredited college or university and provide their GMAT scores. Those who already hold an MBA may seek a waiver from this latter requirement. While the program does not require proof of previous work experience, staff members view this experience positively when making admissions decisions. UC Denver is regionally accredited by the Higher Learning Commission. Southern Connecticut State's MS in sport and entertainment management focuses on facility management, marketing, finance, legal and ethical issues, and global issues affecting the industry. Students graduate knowing how to communicate, how to make sound business decisions, and how to conduct thorough research. Required courses include sport and entertainment law, sport ethics, operational research, agent and artist management, and sport administration. Applicants to this fully online MBA in entertainment management must have a bachelor's degree from an accredited postsecondary institution and an undergraduate GPA of at least 3.0. While the program does not require GRE or GMAT scores, it does ask for letters of recommendation. SCSU is regionally accredited by the Commission on Institutions of Higher Education of the New England Association of Schools and Colleges. While earning a master of entertainment industry management online, graduate students take core classes in media management and leadership, media sales management, and media law. An online MBA in entertainment management may also emphasize business skills. These courses prepare graduates to work in a variety of media professions, such as producer, public relations manager, and advertising manager. When choosing an online master's in entertainment management program, prospective students should consider whether a program's specializations align with their career path. Some programs, for example, offer a specialization in music management or advertising, which lead to different professional paths after graduation. These specializations allow students to tailor their degree to their interests. Prospective students should also consider factors such as program cost, time to completion, and graduation requirements. The total cost of a master's degree varies depending on the institution and the number of required credits. Students can pursue financial aid opportunities to lower costs. Some entertainment management programs offer accelerated or part-time options, allowing students to complete their degree at a suitable pace. Graduation requirements vary, with some programs offering internship opportunities or requiring a final project. Online master's in entertainment management programs feature unique curricula, graduation requirements, and specializations. Prospective students may prefer a concentration in music management, television management, or media advertising, depending on their desired career path. By researching these considerations, students can find a program aligned with their goals. Graduate students learn foundational skills in media management and leadership, including theories of management, social responsibility in media management, and organizational issues in media. This course covers economics in media industries, business models for different segments of the media, and decision making in media industries. Graduate students may also study consumer demand, risk management, and revenue generation. Specialized courses like TV management focus on the skills required for specific media industries. This course studies new media, proposal writing, and research strategies for television management. Classes on media law cover the regulations governing radio, television, music, and other media industries. The course may include contracts, negotiations, intellectual property, and collective bargaining. Courses in media sales management cover advertising sales, media sales leadership, and new technologies in advertising. Students learn about the media sales process and emerging changes in the field. After earning an online master's in entertainment management, graduates pursue a variety of career paths. Professionals can specialize in advertising or public relations to promote a client such as an actor or musician. They may also work for a production company or studio, promoting the company's movies or television shows. The degree also prepares graduates to work as producers. Producers help to create movies, television shows, theater productions, and other productions. They make business and financial decisions, raise money for projects, and play a role in the hiring process. Producers may also set the budget and ensure the project stays on deadline. A master's in entertainment management plus experience qualifies professionals to work as producers. Advertising managers create advertising campaigns, sell advertising time, and promote clients or groups. In entertainment, advertising managers may develop ad campaigns for particular clients, or they may work for a studio or production company. A master's degree helps advertising managers advance their career. Public relations managers oversee the public image of their client or employer. They may oversee a staff of publicists, act as a spokesperson for the media, and develop an image or identity for their client. In entertainment, PR managers may work for an entertainer or a studio.